Beast Sports Nutrition is kind of a big deal. So naturally, you know that we have been keeping tabs on their pre workouts Beast Mode and Beast Mode BLACK. What do we think? Keep reading and find out! The original Beast Mode pre workout is pretty great, from a not so overly caffeinated perspective. In the gym, Beast Mode feels clean, giving you just enough energy and focus to really nail every exercise you set out to do. This is thanks to the caffeine, choline, DMAE, snake root, and ginkgo biloba to name a few. But the endurance is pretty good too, and we attribute that to the electrolyte matrix alongside beta alanine. While the beta alanine is carnosyn, it is in a proprietary blend that is less than 3 grams, meaning, no matter what there isn’t a clinical dose of beta alanine unless you’re taking two scoops (see beta alanine guide here). Fortunately, that really doesn’t hold this pre workout back. As a whole, we liked Beast mode, and consider it to be a smarter alternative to Cellucor C4. 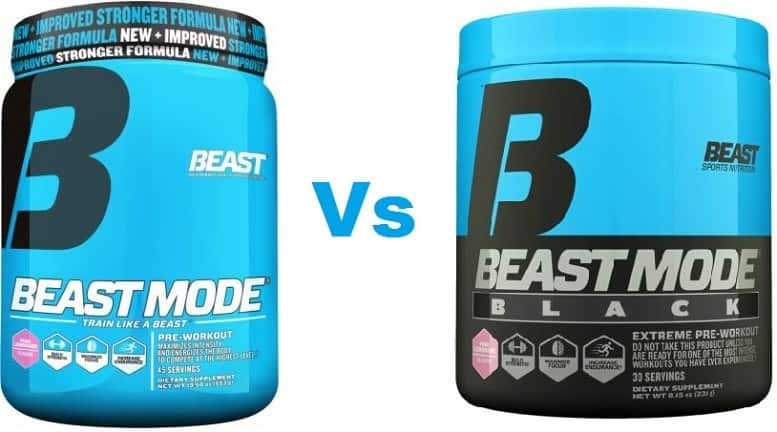 The original Beast Mode pre workout contains proprietary blends, so we are limited in knowing the exact amounts of each ingredient on the can. It could be a gram, it could be a thousandth of a gram. Beast Mode Black on the other hand is fully disclosed; which is pretty darn ethical considering how potentially dangerous this pre workout can be in the wrong hands! Take a quick look at the label differences below! We have similar ingredients connected with color coordinated arrows for your convenience. 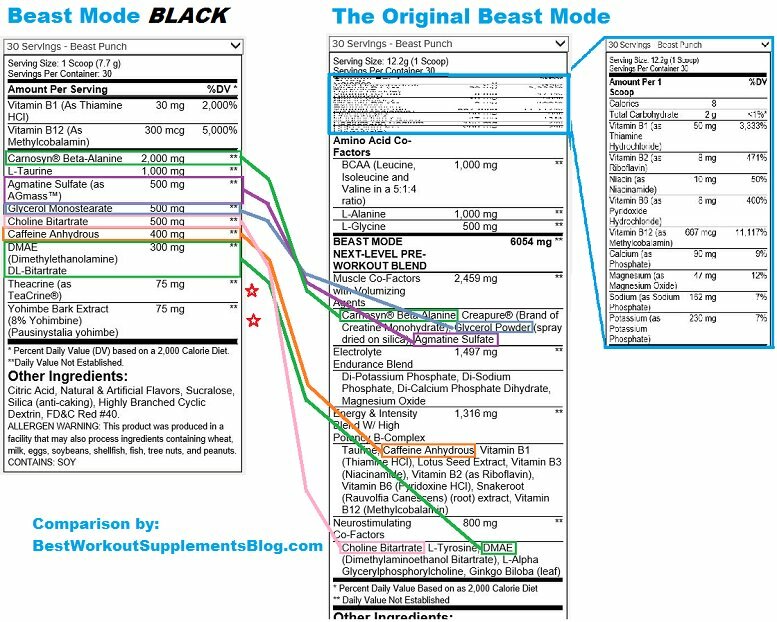 As you can see, the original Beast Mode pre workout formula contains many more ingredients than the new Beast Mode Black. However, Beast Mode Black contains a much larger stimulant matrix. This includes Yohimbe and Theacrine which are not present in the original Beast Mode formula. In addition to Yohimbe and Theacrine, which are both very powerful in their own respects (you can read our Yohimbe Guide Here) you can see that there is a massive caffeine dose in this pre workout. Typically, we enjoy pre workouts that have just under 200 milligrams of caffeine. That’s like, two cups of coffee. Beast Mode Black on the other hand contains 400 milligrams of caffeine, which is nearly 4 and a half cups! Don’t go having a heart attack in the gym… Kidding but not really. By the way, you can see how much caffeine is in your pre workout here. Beast Mode Black is massively intense compared to other pre workout supplements. Lifting weights while on this pre workout is like being in another frame of mind, thanks to the over-the-top stimulant matrix in this pre workout… Which essentially encompasses this entire supplement. In the gym, lifting on Beast Mode Black was what we imagine being on drugs to be like. The energy was off the chain, tunnel vision was present, nerve strength was powerful, and weights were being thrown around! For about 45 minutes, Beast Mode Black unlocks lifting potential. However, during that time you may not be the most ‘normal’ looking dude in the gym as you are drenched in sweat and a bit twitchy/shaky. Towards the end of your lift, Beast Mode Black typically hit us like a brick wall. But, it’s a high caffeine, high stimulant pre workout which is what we expect. It’s a one two punch between the dehydration this kind of Yohimbe loaded pre workout causes, and the natural dehydration that occurs during an intense lift. End result? More water goes out than can go in – leaving you winded and dizzy towards ‘closing time’. Overall, Beast Mode Black was an intense strong stimulant pre workout comparable to the likes of Finaflex Stimul8. To sum up everything we know about Beast Mode and Beast Mode Black pre workouts, we have a simple recommendation. If you are new to pre workouts, reach for the original beast mode. It’s plenty powerful and will have you going for hours! If you are acquainted to pre workouts already, and can’t find something strong enough, then consider Beast Mode Black, but be smart and take half a serving to start. No matter your beginnings, be sure to check out our pre workout rankings and other supplement rankings across this site. We are pros.